In 2006 I was working at a conference company and I wanted to book Brian Solis as a speaker because he was the foremost thought leader on the topic of social media. Almost ten years later and Solis continues to be on the forefront of digital innovation. 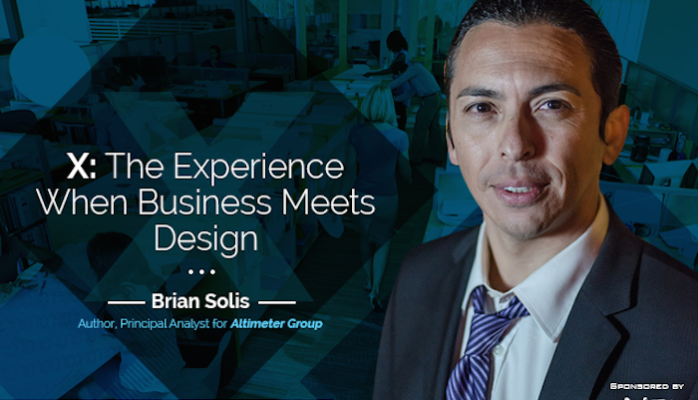 Solis, the Principal Analyst at Altimeter Group has recently published his new book X: The Experience When Business Meets Design. He joined me for the Modern Customer Podcastto share more of his ideas and inspirations for his book. Solis says companies that compete on an experiential level can charge higher prices, generate and retain more customers and overall outperform companies that focus on shareholder value. Solis says we live in a time where there’s a confluence of technology and innovation that has an effect on societies. The idea of a brand is not what it used to be. Today’s brand is created and strengthened by visuals, images and business infrastructures. Additionally the modern brand now becomes a piece of someone else. In the podcast Solis also says we’re becoming an accidentally narcissistic society – a brand has to be relevant, understand who the consumer is and who that consumer wants to be. A brand has to become a lot of different things to a lot of different people. Experiences according to Solis are the new brand. Today we need experience architects not brand architects. Solis says a brand is measured in what he calls “expressions,” not impressions. Why is Apple the most innovative brand in the world? According to Solis it’s because Apple thinks strategically about experience architecture. Companies today need to think about experience architecture at every point across the organization just like Apple does. However the problem today is companies get caught up in quarterly pressures—it takes disruption or an influential change agent to make the case to do something different. Very few companies are thinking and acting about what Solis calls the “x” factor. If companies don’t innovate, they risk their business. For example Uber took the taxi industry because the taxi industry stopped innovating (or never really did). They stopped competing for relevance. Measuring success by impressions, conversions, sales, projections and revenue destroys the customer experience. To add insult to injury Solis says we use technology to get further and further from people. The biggest opportunity for innovation looks at how we fight for relevance. One example is Airbnb. Solis shares the story of Brian Chesky who read a book by Walt Disney and was influenced by the idea of storyboarding. Chesky brought in a Pixar artist to lead Airbnb through a storyboarding process to understand the different types of Airbnb hosts. He looked at different customer profiles as well. They took all the data from the customer and the host side and found friction—room for improvement. They then storyboarded out a new story—one for hosts and one for customers. Airbnb came up with their new logo, new positioning in the market and built a new community for their hosts (including an entire conference specifically for hosts too). We know how the story with Airbnb unfolds—they’ve achieved massive success. From Solis’ interview it’s clear that by understanding the customer experience your brand can accelerate customer acquisition and retention. Don’t miss our podcast where you hear from Solis what gives company the “x” factor!